Debe realizar reservaciones con al menos 5 minutos de adelanto en Numero 28 Pizzeria - UWS. Food was very good. The Numero 28 pizza was delicious! Service was slow but overall a good experience. Does't look great from the outside and the inside is not much better but they serve some of the best pizza around. A little pricey but the service is fast and the food is delicious and plentiful. A neighborhood favorite. We typically dine there several times a month. Great service. Excellent pizzas, terrific salads. We take out-of-town guests there frequently and all rave about the food and service. Highly recommend. New menue with amazing dishes. We were still able to have some good food we had before too. It was delicious as always. Going in we feel like family. They always remember us and take good care of us. We are very happy. Great food and service. Monday they had live music, The ambiance was great! The best Pizza! very authentic!!! I will definitely go back! Great food and wine! No coat check and a tight squeeze inside though. Pizza is easily the best pizza in the neighborhood and I know of only one other in Manhattan that I think is as good. Because the pizza is so outstanding, we rarely try the other dishes, but they have been very good. Seating is a little tight but acceptable for an informal Manhattan place. Absence of coat rack or or a SINGLE coat hook ANYWHERE is a real inconvenience that gets worse with cold weather. I will walk away if the place is crowded since I can't guess where we'd put long coats, bulky fur coats. This is really shocking indifference to a customer's comfort and the quality of the total experience. Napkins are annoyingly flimsy, really short-sighted, penny-wise and pound foolish. Put a couple in your pocket before leaving home; won't hurt, might help. But if you can manage the cold with just a jacket or short coat and have an extra napkin in your pocket, the pizza is glorious. Great neighborhood spot! Lots of healthy pizza options - very accommodating for vegetarians/vegans/gluten free. Service was great - very friendly staff! Great date spot and friendly, accommodating staff. Food is always delicious and they allow you to take your time to enjoy the meal. Definitely coming back. Food was great but manager is horrible. Manager asked us why we didnt tip more in the middle of us paying, forcing the other half of our party to give a larger tip. When we brought up to the manager that this was unprofessional and uncomfortable she started to fight with us making the experience worse. We do not want to come back anymore which is a shame as the food was good. Although we still gave a reasonable tip, we decided to give a bit less due to the fact they we mentioned to our waitress mulitple times we were suprising a friend for their birthday. They never brought out the dessert and gave us the check - ruining the birthday. We also had 2 different waitresses throughout our meal. Would not recommend going here as management is known to be rude. As always, we had a lovely evening with the wonderful food and staff. It would be nice if in such a small, intimate space, that the music were not so overbearingly present. It makes it difficult for a conversation, and there is quite enough ambient noise with the other diners. Music should be an enhancement, not an interference. So hope that the noise level is adjusted so we an continue to enjoy Numero 28. A++ - we have enjoyed many family celebrations at Numero 28 UWS. The staff & the food are always fantastic! Francesca, the manager & Tamara, our server are so incredibly accommodating, attentive & professional. Our favorites: pizza (of course) is beyond nyc's highest standard, branzino is always fresh, steak is tender & juicy + wonderful grilled vegetables. In warmer weather, the outdoor dining is amazing. It's a great restaurant for a simple casual meal as well as an awesome gathering space for a group. We especially love how Francesca & Tamara will do whatever it takes to insure we have a wonderful dining experience. The best upscale pizza in town. On a class of its own, comparable to other similarly great offers from Martha, Motorino et al. The food was delicious, and it was a great experience with two 3-1/2 year old boys. The staff couldn't have been nicer ! We had a very pleasant time overall! It’s our comfort place. We love the food. The staff knows us. Tamara and everyone else are soooo great! I haven't been here in a couple months but what a change. Pizza was super cheesy. More like a Pizza Hut pizza than what Numero 28 used to make. I didn't recognize any of the servers or the guy making the pizza so maybe there has been a change. Great pizza and salad. A bit noisy and service a tiny bit slow. But the quality of the food is excellent and it is a short walk from home. Pizza came out burned and the manager/server was rude when I brought it to her attention. The best pizza on the Upper West Side...can customized the ingredients. The staff is friendly and accommodating. Excellent pizza and salads. Congenial wait staff. Pleasant environment. Lovely service. Food was nicely served and delicious. My only disappointment was that out table faced the kitchen and bathroom. This is a really good family restaurant. The pizza is fabulous. Then service is impeccable. A good friendly place. Not fancy and a bit noisy, but our kids and grandkids love it! Great food, great outside dining and wonderful service. Very family friendly. Great CRUST! Every time we come it's great!! Fantastic Pizza and Bruschetta! Equally fantastic service!! Visite des 3 times In the past 3 weeks..
Family fun and great for taking guests from out of town.. casual but really great food!! 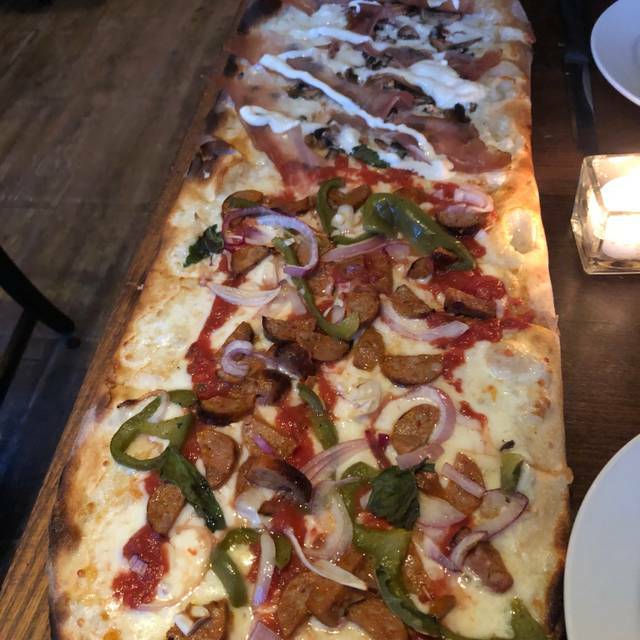 I am Italian and I can confirm this is one of the best pizzeria in NYC! I love this place! Love the pizza (we had the large Margarita) but hate the loud music, which really detracts from the pleasure. Great neighborhood spot, and the service could not have been more attentive. We each had salads, and shared a pasta and a pizza. Perfect all round. We'll be back, and I don't say that often. Numero 28 at the UWS is my go-to Italian restaurant in this neighborhood. The food is authentic & everything is delicious (from the appetizers, the pizzas, pastas and of course, dessert) and speaking of their pizzas - I always enjoy watching the pizzaiolo (pizza maker) prepare my pizza which is usually the Pere or the Numero 28 (their best selling pizza I think). Everytime i have a friend in town, I always try to bring them here. The staff is nice and when i'm feeling lazy.. They're one call away for delivery. (Kudos to the delivery team!) Overall, 5 stars for this neighborhood gem. Pleasant, casual neighborhood restaurant. Terrific rectangular pizzas with interesting toppings from small to large that make sharing easy and part of the experience. A mixed demographic of young professionals, families, older adults -- very welcoming. Have only had pizzas and salads but other menu items look interesting and a little more unusual than other similar places.